Reaching a post of significance is something to be proud of. I never thought Some Kind of Star Trek would last 50 posts let alone 100. Let's talk 100 - the 100th episode to be exact and it's role within the Star Trek franchise. Of course there have only been three Episode 100's in The Next Generation, Deep Space Nine and Voyager which different success. But what has made them special? Unique perhaps? Let's examine the facts starting with Redemption. Probably in the big picture this is the most memorable 100th being the last episode of The Next Generation's fourth season and also the first time Star Trek had reached that landmark. There would never be a hope in Sto'Vo'Kor that they could live up to the hype of The Best of Both Worlds from a year earlier but that really didn't matter. This was number 100. There was cake, celebration and the end of a landmark fourth season that had not only clicked the 79th but also the 80th episode. Did we also mention that this was the year of the 25th Anniversary? Probably not - so as you can see this was one Star Trek packed year where all eyes were on the franchise and a series that was going from strength to strength. Now rated as one of the best seasons in the show's run and more recently launched on blu-ray as the feature-length remastered movie it's first half is a damn good episode and paved the way for a lot more "part one's" that were far superior to their conclusions. For me it's a wonderful episode and Worf's resignation is a great move although it does feel a little like we're short-changed after Picard getting assimilated the previous year. BUT on the flip-side it puts the Klingons back in the warrior-race frame and shows they haven't all gone soft and cuddly. 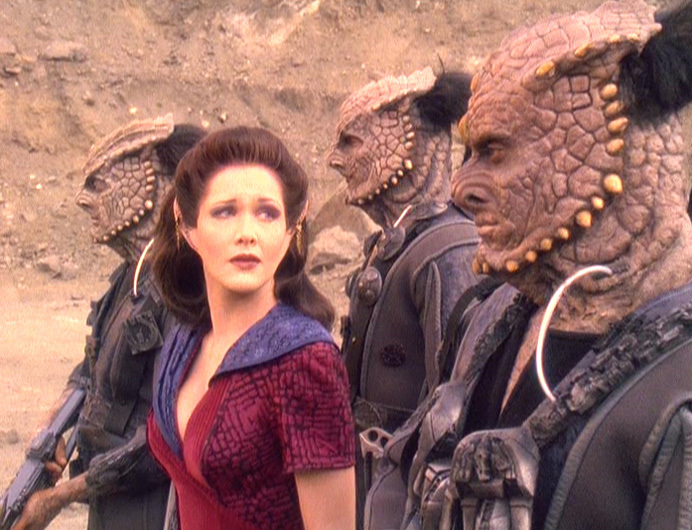 In retrospect now though Deep Space Nine really threw everything into the air with our favourite culture by having them withdraw from the Khitomer Accords in The Way of the Warrior. 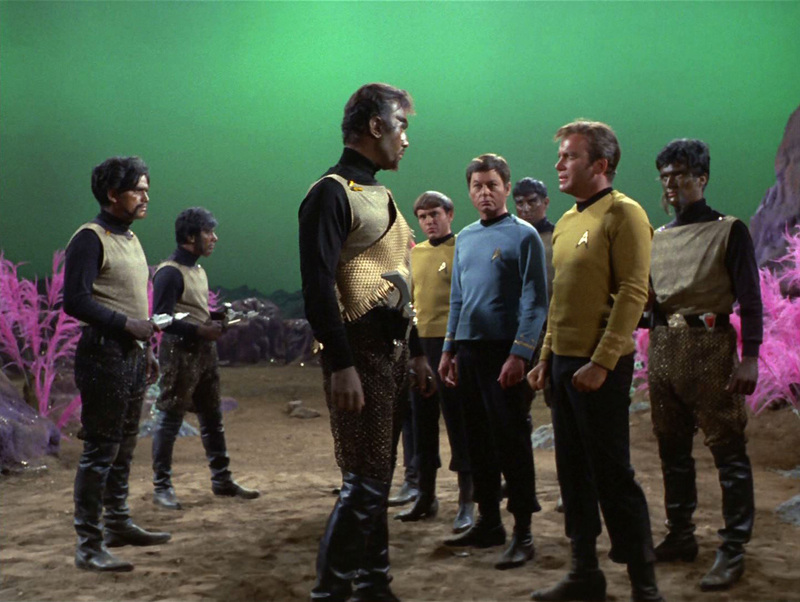 That was a show that restored the Klingons to their The Original Series origins and nature. 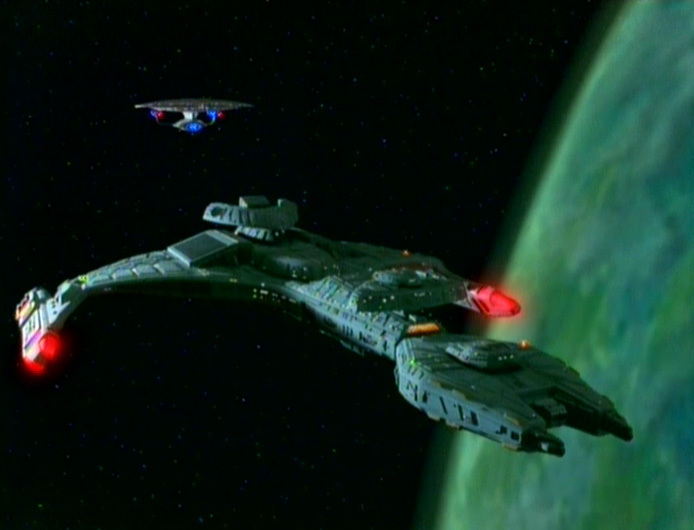 Nicely though, episode 100 was also a rare example of a continuing story within The Next Generation. 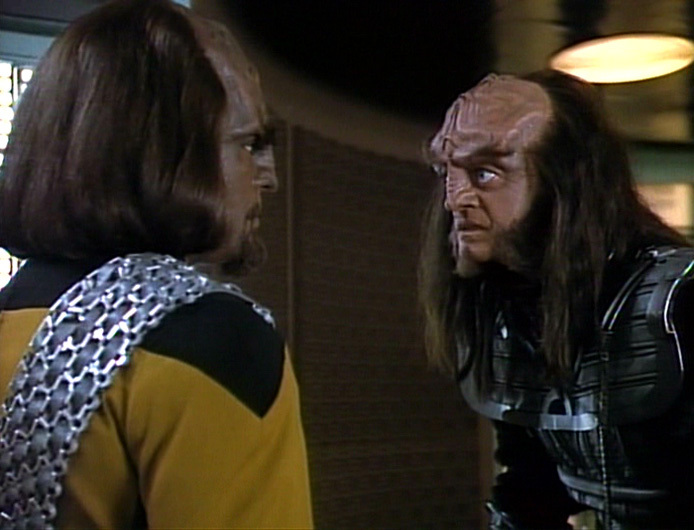 Effectively this whole scenario of Worf/Gowron/Duras had started way back with the introduction of K'Ehleyr back in season two's The Emissary, continued through into Sins of the Father and Reunion as well as suggestions of Romulan subterfuge in The Mind's Eye and the shadowy figure of Sela as revealed in the dying seconds of the finale. Yep. It was. Now I love this episode as a show but there's nothing that screams "100th Episode" here at all. Why? Probably because their budget was being diverted elsewhere. You have to remember that this story aired in 1996; the 30th Anniversary and also two episodes removed from Trials and Tribble-ations which sucked a lot of resource. Something had to give I guess and this was it. Remember we've only just noted that Redemption was aired during the 25th Anniversary. Maybe it's something to do with the style of Deep Space Nine even that such a landmark was just carried as if it were a regular episode. 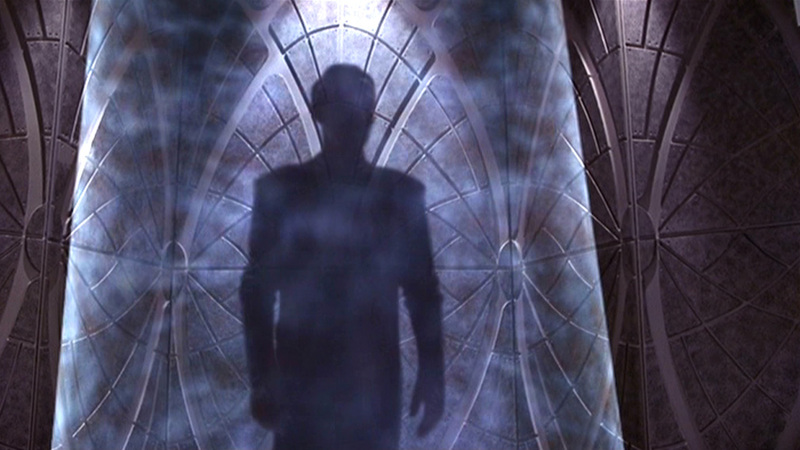 The show's superiority on occasions was its ability to remain under the radar and produce some mammoth episodes - who can honestly say they knew In the Pale Moonlight was going to be THAT good or that the Galaxy Class Odyssey would get totalled in The Jem'Hadar only a few weeks after The Next Generation had concluded?! Nevertheless it was a great start to the season following the conclusion of the Gowron/Changeling cliffhanger of Broken Link in Apocalypse Rising. Building an upside-down Jem-Hadar ship can't be all that inexpensive and neither can a lot of outdoor filming. The twist as to what the Dominion footsoldiers and their Vorta overseer are looking for is brilliant and did keep me guessing on the first watch. Subsequent viewings highlight the futility of the whole operation and the lack of trust that exists between the two parties - just how a little bit of honesty would have made a difference is searingly obvious by the conclusion. 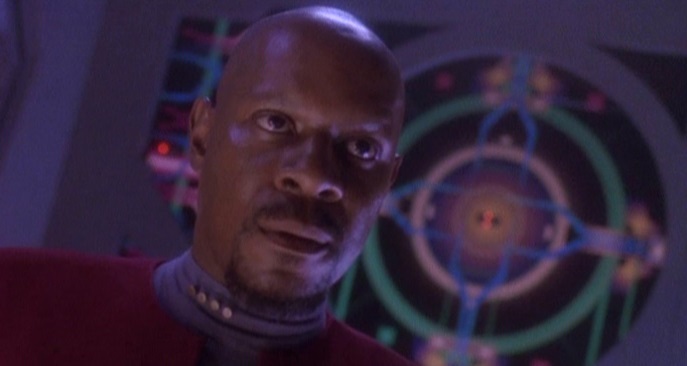 As you might expect with Deep Space Nine, the ending itself is far from uplifting. Everyone appears to lose something and whether or not the "prize" of a Jem'Hadar vessel is worth it becomes the ultimate question. Fortunately this was one of the strongest things going for the show - in life we can't just hit the warp drive and skip to the next planet; actions have consequences and Deep Space Nine never feared to stick them right in the spotlight. Maybe the way that The Ship slips past is also more in line with the Deep Space Nine ethos. Essentially it was business as usual, little ceremony and gritty realism. 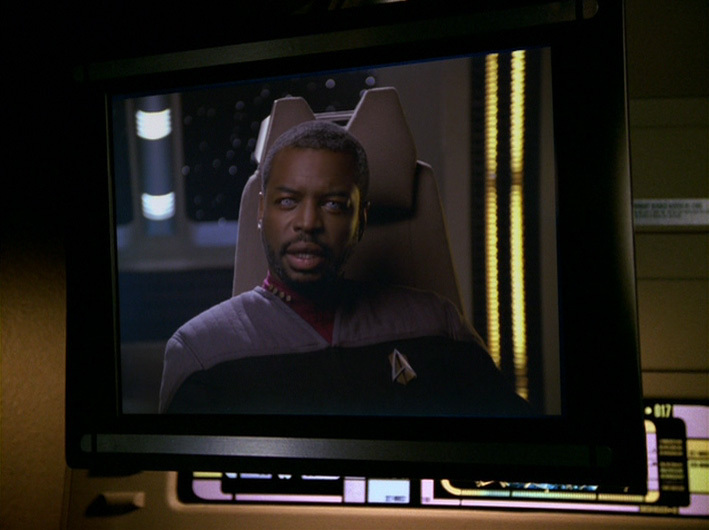 Nothing makes a landmark episode stand out more than being directed by LeVar Burton, guest starring LeVar Burton as Captain Geordi La Forge, crashing the ship, burying her under ice and using time travel. 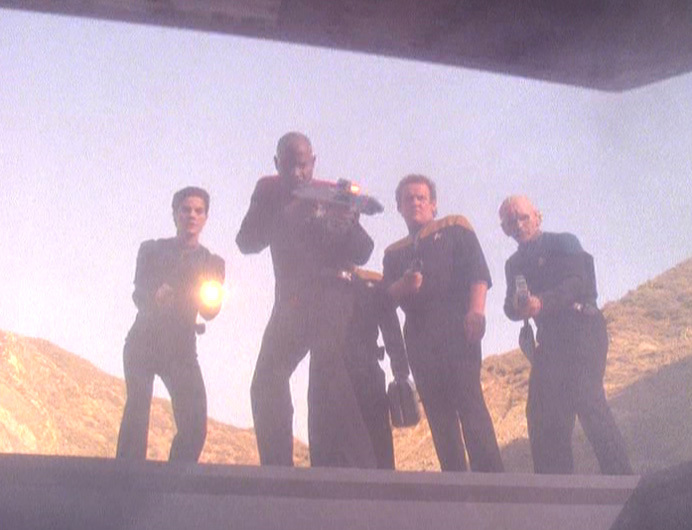 It also shows up how poorly treated the 100th installment of Deep Space Nine was in comparison. 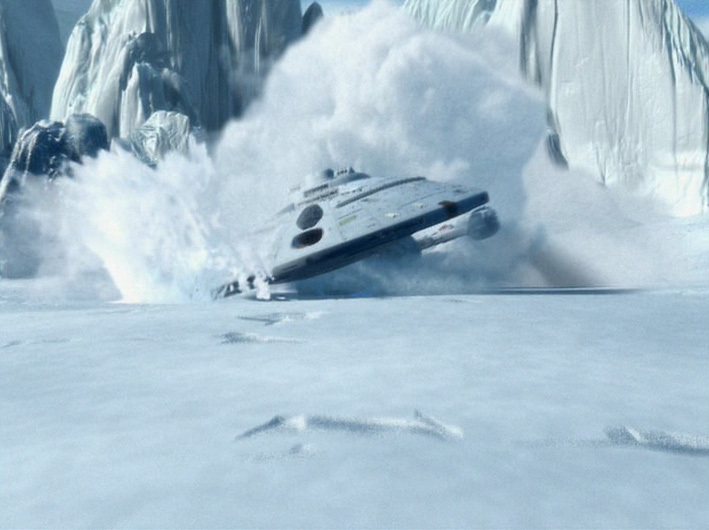 Featured early in the fifth season of Voyager, Timeless is one of the high points of the show full stop. What isn't there to like about an episode that has evidently been made to stand out. Perhaps they should have tried some of the ideas in Flashback to make that a more memorable event than it was in the second/third season. Beltran and Wang are at their best here playing older but not necessarily wiser versions of themselves as they attempt to save the Voyager of the past from the deep freeze. Want a great effects sequence? Try the crash-land here. It easily beats Generations for impact (pun intended) and looks a darn sight better even on a small screen. Want a jaw-dropper moment? 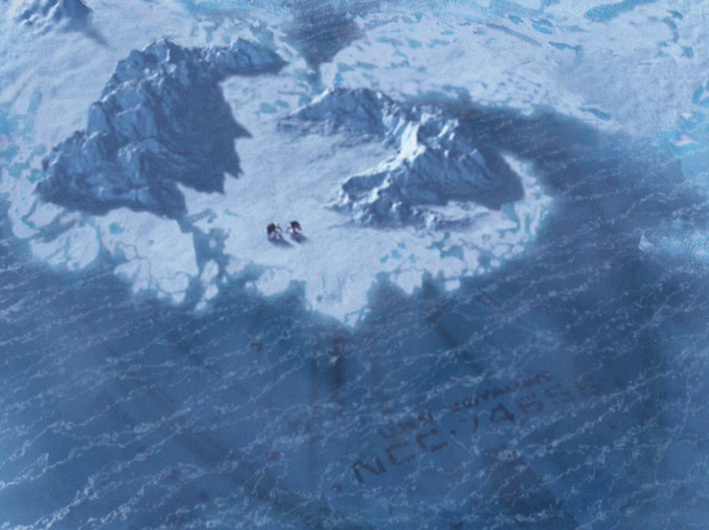 How about the teaser shot of the ship buried under the ice pack? Adding in La Forge for a cameo isn't the unexpected pleasure it should have been due to the fact his name is emblazoned across the onscreen titles in the first five minutes of the show. Oh - was that a Galaxy Class starship he's commanding? Yep, it is. As an episode goes there are some great nods and more than one boat being pushed out to turn in something both memorable and special. 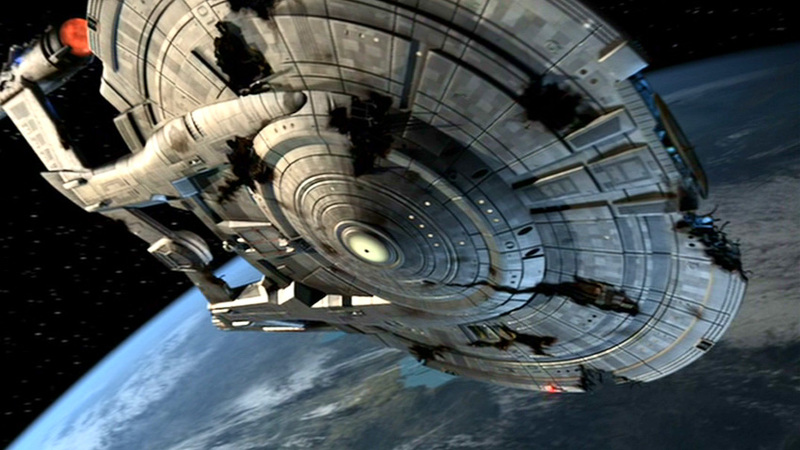 Timeless is a feel good TV 45 minute movie that flips the reset switch that Voyager was so good at doing. At times the series really pushed those cliched boundaries to the limit and dared to be different and prove itself not just a poor man's The Next Generation. It also proved that the show didn't have to rely on the Janeway and Seven relationship; there were other cast members after Scorpion, Part II that could be well utilised. I for one think Chakotay was woefully underused in later years after his heritage was laid on thick in the first two seasons. So those are the three that made it to the ton. However, let's just theorise for a second. What would have happened if The Original Series or Enterprise had made it to the 100 mark? 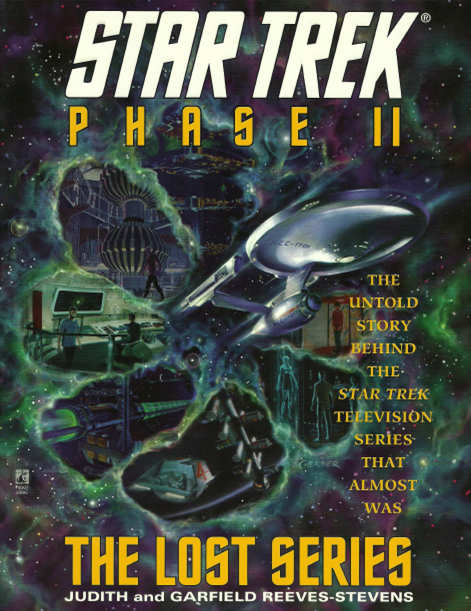 The Phase II book is one of my favourite reference pieces because it deals with a might-have-been; a series that almost but never was and is definitely in the spirit of the original 79 episodes. Now on a piece of guess work I reckon that episode 100 would have fallen into the last few stories of season four. The preceding three years had inconsistent numbers of episodes but adding another 21 on gets us to the magic number so it SHOULD fall in the never-made '69-'70 season. I would hazard that budget might also have been a constraint given that the third year under Freiberger was more tightly funded than a staff outing from Quark's Bar so a lot of the shows might have even been bottled (on ship) or using very minimal/reused sets. It's more than likely Freiberger would have had a second chance to kill the show if it hadn't in season three. The Kirk/Spock/McCoy triumvirate would probably end up in some sort of sticky away mission scenario involving a love interest for the captain and one or two logical scenarios for Spock to master. Computer for Kirk to defeat? More than likely and if not a computer surely a man to man fist fight before the closing titles. Maybe we could have even hoped for a return from one of the three Klingons or even a fourth to terrorize the Enterprise and her crew. Redshirt death? Think we can probably add that one to the checklist as well. I'd hanker for that taking place pre-titles, just before the long drawn out fade to black from Kirk's shocked, overacted expression. Worry not though that the even more budget trimmed episode was made though, it'll get remastered by Mike Okuda about 40 years later! But hey, we have no idea what would have happened if Star Trek had made it into a fourth year as it only just scraped the third and that was certainly below par to the preceding two years on a number of levels...Spock's Brain anyone...? Another path could even have meant that if Star Trek had made it into 1970 that the style might have had to change with the times. Roddenberry would have been totally out of the picture by this point but how might another set of live action stories have changed the future of the franchise? Would it have just disappeared into the vaults? Would Phase II have been made and The Next Generation never have existed? Might it even have happened a few years earlier - imagine how that might have changed the nature of the show and characters. Perhaps this is something we could more easily work out. Given that if the show had made it to the fifth season we would have lost the terrible These Are The Voyages... and maybe even managed a cliffhanger to ensure that we knew year five was on the cards. By my reckoning the 100th episode would have fallen two episodes into the season as with Deep Space Nine but probably would have received a greater fanfare. My thoughts are that there would have been three likely scenarios for the landmark story. First - that we would get the reveal of just who Future Guy was. Hopefully it wouldn't just turn out to be James Horan. Brannon Braga famously stated that Future Guy was going to be revealed as Archer but I'm not sure if that was just to stir the waters a bit. Could it have been, as was thrown around the internet a while back, Kirk? What about one of the crew from Voyager for instance for a bit of spice? If Netflix does pick up the show then maybe we'll actually find out - although it might be under the budget restraints that we were familiar with back in The Original Series' third season...and we all know what happened there. Second option - how about kicking off that Romulan War that we've heard so much about over the history of the franchise? A cool cliffhanger introducing the threat would have worked and then to really start the season, episode 100 could have shown the spark that started it all off in style. Would that have perhaps been a better occasion to kill off one of the main cast? Third option - some kind of cross over episode with The Original Series or even one of the later shows but NOT a holodeck story as with THAT episode. The fear is that These Are The Voyages... would have ended up here and not as the final episode made. There's a chilling thought. Thinking back to that Netflix possibility though, a severe cost cut might even see the entire episode and most of the (shorter) season entirely set on the Enterprise and standing sets. So where would The Original Series or Enterprise have journeyed for that 100th episode and do you think our thoughts are anywhere near? The 79th, 80th and 100th episodes are probably the ones we all looked out for. Would the series make it to one of these points? How would it be memorable and what unique storyline would they attempt? Would there be homages to Kirk and co? Deep Space Nine managed to hit both 100 and within two more episodes they bagged an utter classic with the 30th Anniversary episode Trials and Tribble-ations which did precisely that. In the pages of Star Trek history though it will surely be The Next Generation that is remembered most strongly because they were the first crew to set all the records and film the most episodes at 178. Personal favourite? I'm a sucker for saying Deep Space Nine but I have a stronger yearning for Timeless. It has everything going for it in a single-length story. Once again a Voyager conceptual triumph that I always place alongside Living Witness and Blink of an Eye. While that later series wasn't my top choice overall it had some sparks of absolute scriptwriter genius (see noted examples) which ensured that it wasn't a copy of The Next Generation in nature and might even have been the most innovative of the shows created. Timeless is a classic time-travel story and while it might not have the heart of Deep Space Nine's The Visitor it does reinforce the loyalty of the Voyager family and the desire to do good/correct the errors of the past which crop up on more than one occasion in the show's near-50 year history. Good story, Mr Berman, even though we all know it'll be fine at the end in true Voyager style. Luckily the finger was kept off the Reset Button - at least for a fair few years within the structure of the narrative! Here's to the next 100 pieces from Some Kind of Star Trek. Thanks for reading, commenting and joining us in every aspect of the franchise and we hope you'll stick with us and even subscribe!